Photos taken the day after the 2011 grand final… additional photo of Richmond training in 2004. CURRENT Melbourne CEO Cameron Schwab grew up as a Richmond supporter. His dad Alan was the secretary of the Tigers from 1968 to 1976 and sec/treas for the last five of those highly successful years. The Tigers played home games at Punt Road Oval up to 1964 and it remains their administration and training venue. 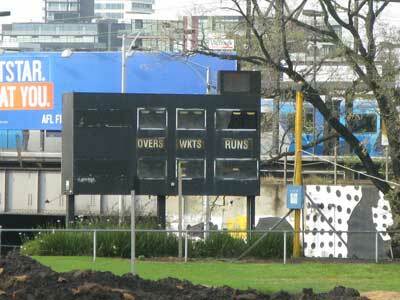 One summer the Richmond footballers took part in a cricket match at Punt Road Oval. 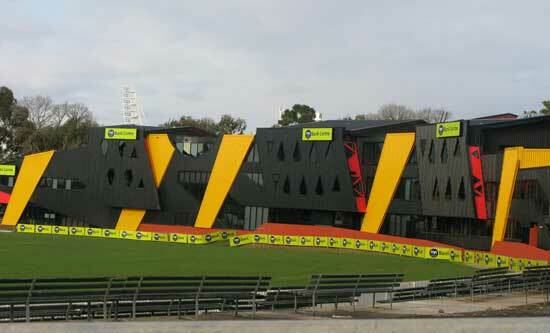 These days Punt Road is resplendent in yella and black and there are two scoreboards. The electronic board looks tired and old while the Doug Ring-Bill Johnston scoreboard stands proudly ready for action. Ring and Johnston relieved a bit of scoreboard pressure for Australian in the 1951-52 MCG Test against the West Indies. When last man Johnston strode to the wicket the home team still needed 38 to win. With Ring hitting out and Johnston playing as safely as his limited batting talent would allow, the pair got the runs. It was one of the most famous of last wicket stands. 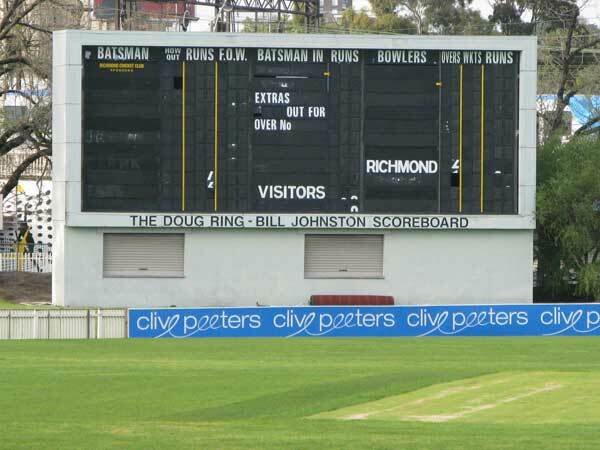 Was driving past the Punt Rd Oval during the week and noticed the Doug Ring – Bill Johnston scoreboard is gone. From memory it was a relatively new addition from when first class cricket was played there in the late 1990s. Although cricket is no longer played at the ground, I’d have thought worth preserving for the Richmond VFL team to use. Watching on the TV today they appear to be using a portable road sign as their scoreboard.